This is the moment we've all (well, ME anyways ) been waiting for: the first race in the M3! In preparation, I changed the motor oil (Mobil 1 15w50... EIGHT friggin quarts! ), transmission fluid (Mobil 1 ATF), and rear differential fluid (Mobil 1 75w90) a few days before the event. I feel much better knowing all that stuff is fresh now. I also cut out some new white magnetic numbers and class letters for the car. I decided to go with number "95" for this car (instead of Speed Racer's number "5" that I used on the Mustang) because it's a different car, it's the year model of the car, and I've learned that at Divisional and National level events the cars are run in numerical ascending order in each class. So, if you have a number closer to 100, then you get to run last and can see how all the other class competitors do BEFORE you run (yes, this is an advantage in my opinion). I arrived at the event with plenty of time to show off the new car and walk the course a few times, which was a very long and open horsepower-advantage course. I would've been overjoyed to see the layout if I'd still been in the Mustang, but I wasn't sure how the M3 would do. I knew that I wasn't going to be competitive at the first few events in the M3, especially on street tires, but I was excited anyway. The guy who bought my Mustang showed up with it, and even though the car looked good out on the course, it didn't bother me one bit to know that it wasn't mine anymore (all I have to do is look over at my M3! ). 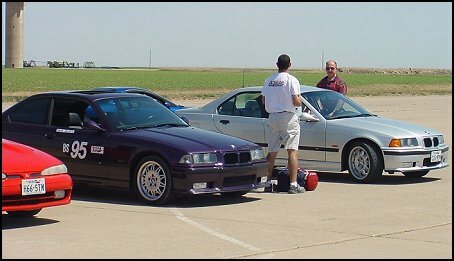 Owen Lafferty was there in his '98 M3 sedan on street tires, so there was another street tired M3 to compare times with. Out on the course the car felt really neutral and balanced but had a little more body roll than I'm used to in the Mustang. The Michelin Pilot SX tires were pretty good for street tires, but I'm looking forward to next season on racing tires. Two spots on the course were very long and straight, and the car got into the rev limiter on the first two runs in both spots (shifted into third gear in those spots on my third run). When I pulled back into the pits after my first run, I noticed a ticking sound coming from the motor. I've read on several M3 e-mail lists that for "extreme" driving, an additional quart of oil is recommended to reduce oil starvation. I had already put in an extra quart when I changed the oil a few days earlier, but even with the extra quart the motor was still ticking. I ran my other two runs despite the ticking and it was still present after I got done. I was really starting to worry about it until I heard Owen's M3 making the exact same ticking sound when he finished his runs! After driving back into Dalhart after the event was over (5 miles), the ticking was gone, and I still haven't heard it again several days later. I did some research on the Net and discovered that this is a common problem when autocrossing an M3. Apparently the M3's motor will hold up to 9 quarts of oil with no problems according to Prototype Technology Group (a professional BMW M3 road racing team), so next time I'll add another quart right before the event starts to see if it that fixes the ticking problem. Good thing I bought a 5 year/100,000 mile drivetrain warranty with the car! I ended up 4th out of 4 cars in my class (18th overall out of 30). Steve Sucsy won the class (and the overall event) in his '00 Honda S2000 on brand spankin' new Hoosier A3S03 racing tires, and Owen was able to run just a tad faster than me on his 5th run. I didn't push the car too hard after hearing the motor ticking, but I'm sure I could've gone faster... especially if I would've run more than 3 runs (I'm only running 3 runs at each event this year in an attempt to save the tread on my street tires until I can get racing wheels and tires for next season)! Oh well, I still had a lot of fun, and I'm still impressed with the car even though I wasn't competitive. I have some Bilstein Sport struts (with trimmed bumpstops) and shocks ready to install on the car that I got from my sponsor, Boost Performance, which should dampen the body roll a little, but I wanted to run one or two events with the car completely stock first. I still believe that this car can be competitive in Stock Class (at least at the Regional level) with struts/shocks, racing tires, and the right alignment settings, so... stay tuned.